Greek Default Watch: Did the 1980s Ruin Greece? Real per capita GDP growth was 0.23% a year in the 1980s, versus 7.9% in the 1960s and 4.64% in the 1970s. In 1980, the average Greek had a standard of living that was 7% below their European peers; by 1989, the gap was 24% below. Unemployment rose from 2.7% in 1980 to 6.7% in 1989. Real compensation per employee was flat in the 1980s, while it had grown 4% in the 1970s. Public debt climbed from 22.3% of GDP in 1980 to 64.2% in 1989. Total factor productivity, an admittedly nebulous measure of how efficiently an economy combines inputs to generate output, fell by 0.85% a year in the 1980s versus a 6% average annual growth in the 1960s and 2.53% growth in the 1970s. Net fixed capital formation, a measure of how much fixed capital was invested in the economy after depreciation of existing assets is taken into account, declined by an annual average of 0.17% in the 1980s, while it had grown by 16% on average in the 1970s. Industrial production grew by a mere 1.3% a year in the 1980s while it had grown by 10% a year in the 1970s. Average inflation in the 1980s was 19.5% versus 2% in the 1960s and 12.3% in the 1970s. In 1989, therefore, the Greek economy was almost uniformly worse off than it was in 1980. Not only was there a real regression in key indicators, but the post-war boom that lasted through the 1960s and 1970s was gone. 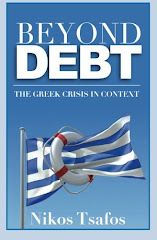 Greece had been transformed from a growing to a stagnant, even declining economy. This much should be obvious to anyone who looks objectively at the 1980s. The corollary to this deterioration was a politics that was based on income redistribution and that created a sense of entitlement that disconnected reward from effort. The language and economic philosophy of the 1980s created much of the rigidity the country faces still. This is reflected not only in the strength of groups such as unions but more importantly in what a large part of the population considers as fair when it comes to wages and the role of the state in the economy. The greatest challenge in reforming the Greek economy is that the government needs to adopt measures that fall outside the spectrum of what many people conceive as even possible. And yet, this redistribution campaign – together with Greece’s entry into the European Economic Community, the settling of the monarchy question, and the legalization of the communist parties – helped consolidate democracy. The left, hitherto either marginalized or persecuted, not only became part of the mainstream but, arguably, became the mainstream. In fact, since 1981, parties of the left have gained over 50% of the vote in every election except in April 1990. This is the flip side of the economic collapse: large segments of the Greek population, often with explosive tendencies, were brought into the political mainstream. Granted, several groups remained outside or at the fringes of the political system, as evidenced by bursts of violence or even terrorism. But there has been no serious systemic political (πολιτειακό) challenge that shook the foundations of the state. To be sure, the last twenty years have been far from violence-free, and in fact, the inability of the state to respond sensibly to unruly crowds owes something to the crowd-control aversion that emerges from the post-war experience of state suppression. Yet Greece succeeded in establishing a framework where disputes were resolved, even though spending money became the primary adjudicator (even suppressor) of national antagonisms. That the 1980s helped consolidate democracy is far from an original thesis, but it is rarely put in the context of “consolidate democracy by spending so much money it ruins the economy.” Clearly, it is impossible to test the counter-factual – could Greece have normalized the politics without massive state spending? We will never know this. But we know that history need not have turned out this way. While there were several factors helping to anchor Greek democracy, it is far from certain that political inclusion would have been accomplished either way. To answer the question, then, did the 1980s ruin Greece, my sense is that the 1980s certainly derailed the Greek economy from a growth-driven convergence with Europe to stagnation. But in doing so, helped anchor Greek democracy and settle big political questions. Even so, the current reform program is very much an effort to undo what was put together from 1981 to 1989. Since the days of the old George Papandreou(1950s) Greece has been spending a considerable clip of its GDP on military arms. Many argue that this is an unfortunate necessity given that many of its neighbors are also spending similar amounts on arms procurement...all from similar sources. Do you know of any reliable figures of approximately how much of the current debt load is because of arms purchased on credit? Excellent analysis. Although the numbers of the 80's do not show a direct correlation to what is happening now, I believe that it set the stage for the present situation. I hope that you will write a corresponding analysis for the 90's.